Nike have a running club of thousands of people across the UK. 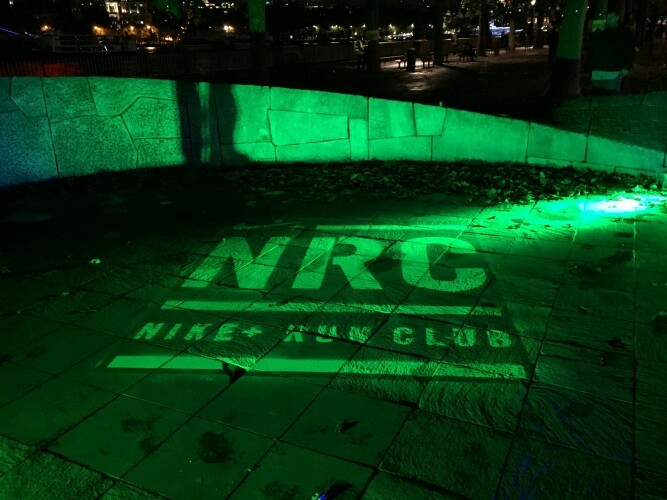 NRC hold a number of fun and engaging running events across several UK cities bringing runners of all levels together to run and hangout and worship anything Nike stylee. Recently the NRC, held an event in London's Southbank. The 5km run was across the city and the fun part about it was it was held at night. This presented a slight challenge for Nike, as they wanted to highlight the route to their runners without going for marshalls with torches or lit signs. So they approached us and asked if we had a solution. We did. Temporary Chalk Spray that glows in the dark. It just so happens that Nike's Running Club also has a luminous green brand colour. So we mixed the two together and came up with 2 metre stencils placed at various locations across Southbank that were there for the four event then vanished without trace afterwards. A perfect, unique solution for a perfect, unique brand. Right message, right media, oh and right colour too!